Last of the ‘old time’ politicians, and uncle to Senator Joe Manchin -WV. A. James Manchin was beloved by his fellow West Virginians and knew most by name. 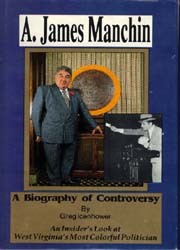 As Secretary of State he became embroiled in a scandal that played out as this book was published. A riveting story about a much beloved man and includes stories about the Kennedys among many, many others. View and read firsthand the photos of and stories about the man who: was the son of a union organizer; demonstrated unbelievable talent for “the politics of inclusion”—while still in elementary school; took on the powerful political machines of the 50’s and won. But how those adversaries—and perhaps his own misguided sense of power—conspired to bring him down in 1989.